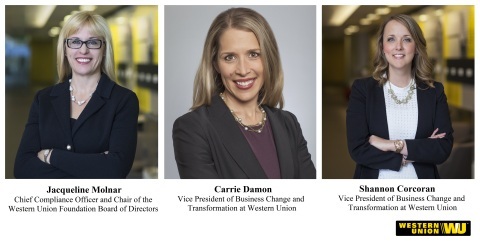 DENVER --(BUSINESS WIRE)-- The Western Union Company (NYSE: WU), a global leader in cross-border, cross-currency money movement, announced the election of executives to non-profit boards serving the Denver community. Jacqueline Molnar , Chief Compliance Officer and Chair of the Western Union Foundation Board of Directors, has been appointed to serve on Denver Public Schools Foundation Board. In this role, she will support the organization’s mission to ensure that every child in Denver has access to a quality education. Earlier this year, Shannon Corcoran , Vice President of Business Change and Transformation at Western Union , joined the Mi Casa Resource Center Board of Directors. The organization focuses on training families, beginning with programs for youth that inspire academic success, leadership, and career exploration. In 2014, Carrie Damon , Vice President of Business Change and Transformation at Western Union , became a Board Member for the Junior Achievement-Rocky Mountain chapter. Carrie has also led Western Union’s employee engagement with the organization. To date, 283 Western Union employees have volunteered with the organization inspiring 12,963 students across 66 different schools in the Denver Metro area to own their future economic success. As part of its continued commitment to the Denver community, on October 5, 2017 , the Western Union Foundation announced an infusion of US $1 million in contributions to local non-profits and its intention to make space available in its new global headquarters for local non-profits and NGOs to host community gatherings. The Western Union Foundation is an independently managed 501(c)(3), United States non-profit corporation supported by the Western Union Company , its employees, Agents, and business partners working to support education and disaster relief efforts as pathways toward a better future. The Western Union Company (NYSE: WU) is a global leader in cross-border, cross-currency money movement. Our omnichannel platform connects the digital and physical worlds and makes it possible for consumers and businesses to send and receive money and make payments with speed, ease, and reliability. As of June 30, 2018 , our network included over 550,000 retail agent locations offering Western Union , Vigo or Orlandi Valuta branded services in more than 200 countries and territories, with the capability to send money to billions of accounts. Additionally, westernunion.com , our fastest growing channel in 2017, is available in 45 countries and territories to move money around the world. In 2017, we moved over $300 billion in principal in nearly 130 currencies and processed 32 transactions every second across all our services. With our global reach, Western Union moves money for better, connecting family, friends and businesses to enable financial inclusion and support economic growth. For more information, visit www.westernunion.com .